It is approximately 17 miles north of I-75 (Alligator Alley) from Exit 49. 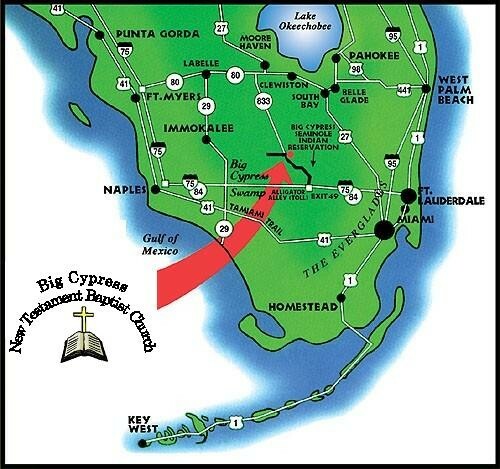 Take 75 north, go through toll booth, take exit 49 (Mobile Station on Alligator Alley), follow signs to the Big Cypress Reservation. Take 82 to 29 going to Immokalee, turn left on 846 by Airport, 846 turns into 833 at the end, turn right, go 14 miles, follow signs to the Big Cypress Reservation. Take 846 to Immokalee Road into Immokalee, turn right on 29, turn left on 846 by Airport, 846 turns into 833 at the end, turn right, go 14 miles, follow signs to the Big Cypress Reservation. Take 75 south, take exit 49 to the Miccosukee Service Plaza on Alligator Alley, follow signs to the Big Cypress Reservation. Take 441 to Belle Glade, go to 27 South Bay, turn right, go north on 835 turn left on Evercane Road, take to end and turn right on County road 833 follow signs to the Big Cypress Reservation. Take 27 south, go through Moore Haven, take 80 west about 5 miles, 833 is on left, take 833, follow signs to the Big Cypress Reservation.